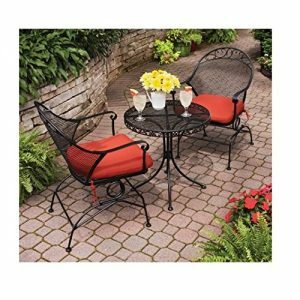 Bring comfort and function to your outdoor space with patio furniture. Whether a comfortable chair or a spacious table, your patio will be transformed into a sensory-rich destination. With a variety of options, patio furniture doesn’t have to break the bank to enhance your outdoor living. Stay within your budget and choose from a multitude of furniture options for your patio, porch, balcony, or other outdoor areas. Relax in your backyard with the Gramercy Home 5 Piece Patio Dining Table Set. With 4 chairs and a table, there is ample room for outdoor dining. With a durable, powder-coated steel frame, the chairs are weather-resistant and long-lasting. A tempered glass top, the table is sturdy and easy to clean. Adding a modern look to your patio or porch, the dining set is a popular choice on Amazon, with a 4.5 star rating. 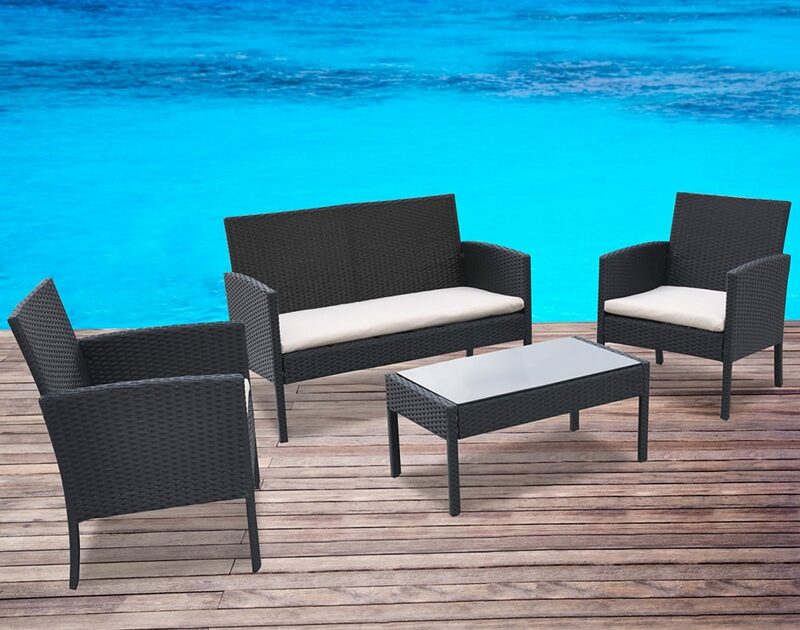 Made of black rattan wicker, the Radeway 4 Piece Patio Furniture Set is a modern approach to patio furniture. 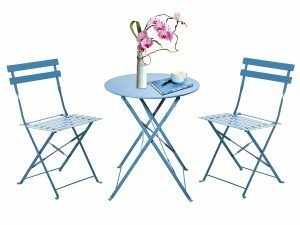 With a steel frame, the furniture set is durable and weather-resistant. Both chairs and the loveseat are accompanied by a removable cushion for a comfortable seating experience. 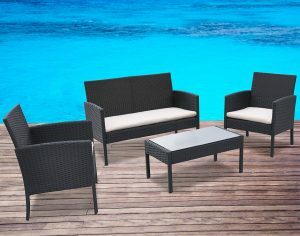 Ideal for a patio, porch, poolside, or garden, the 4 piece wicker set includes all hardware needed for assembly. Rated 3.5 stars on Amazon, it’s easy to enjoy the outdoors with this sleek furniture set. 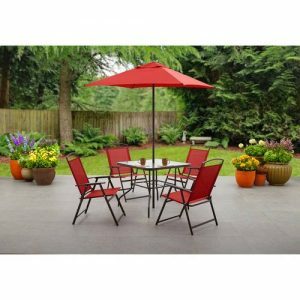 Available in blue, red, grey, or tan, the Mainstays Albany Lane 6 Piece Folding Set is ideal for small outdoor gatherings. The set includes four folding chairs and a table. Featuring patterned tempered glass, the table has a pre-cut hole for the included umbrella. Made of durable, powder-coated steel, the folding chairs are easy to store and setup. With a 3.5 star rating on Amazon, the budget-friendly set fits in effortlessly with your outdoor décor. A simple set with seating for two, the Clayton Court 3 Piece Bistro Set adds a unique look to any outdoor living space. With a 24″ roundtable, mesh chairs and red cushions, the set looks beautiful in any setting. Each cushion boasts UV-rated woven fabric. Resistant to fading, each cushion is also water, stain, and mildew-resistant. Each chair is equipped with a subtle rocking mechanism for some relaxing motion. Enjoy the sunny weather with the 4.5 star Amazon-rated set. 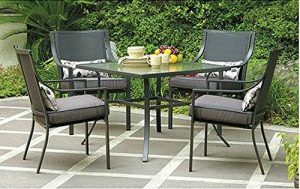 Simple and minimal, the Grand Patio 3 Piece Bistro Set is the perfect option for a small space. Offering a solid steel frame, the set is both weather-resistant and rust-resistant. Due to the construction, the chairs can support up to 300lbs. each. Easy to store and use, both indoors and outdoors, the vibrant blue set looks great with a variety of décor. Made to fold, the set can also be transported with ease. With a 5 star rating on Amazon, the small set is perfect for a patio, porch, or balcony. When choosing the best furniture for your space, there are a variety of budget-friendly options. Patio furniture is available to suit every type of aesthetic. Thoughtful planning and savvy shopping ensure your patio, porch, balcony, or other outdoor space is inviting, stylish and comfortable for years to come.